Why didn't I know about this forum two years ago. 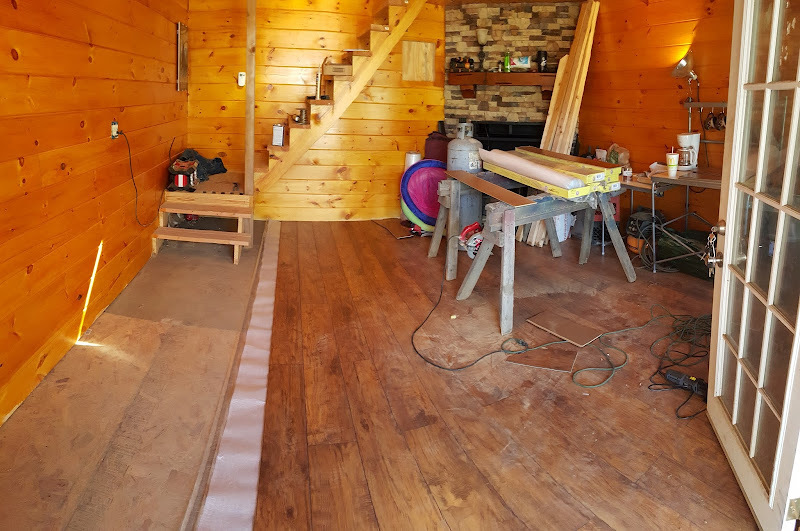 I'm in the finishing stages of my cabin build, and I've been pretty much making it up as I go. It woulda been nice to see how other people done things. I bet I could have saved myself some headaches. I still have some things to finalize, so suggestions are always welcome. p.s. Click on the "Cabin" tab at the top to see everything from the beginning. Cabin looks really cool. Like the original concept drawings. Where in Missouri are you? 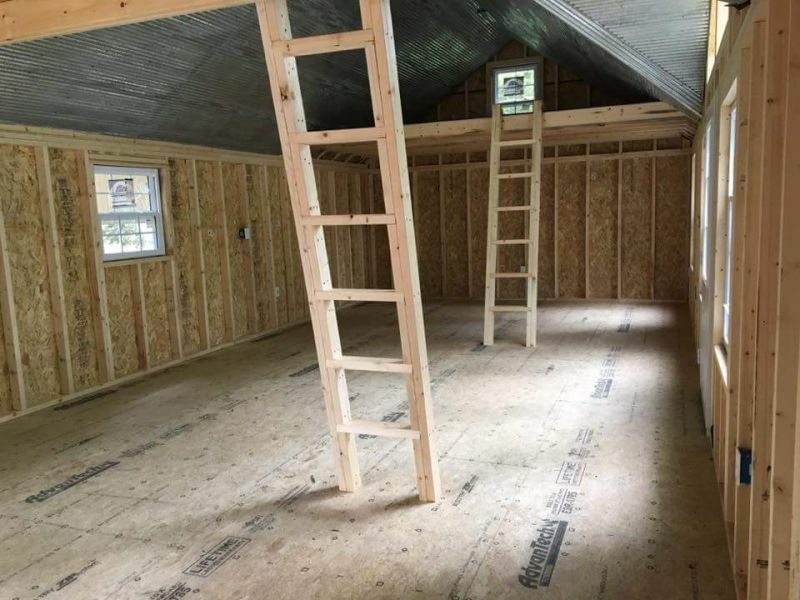 Nice cabin, nice photos of your progress too. Imperial. Just south of St. Louis. 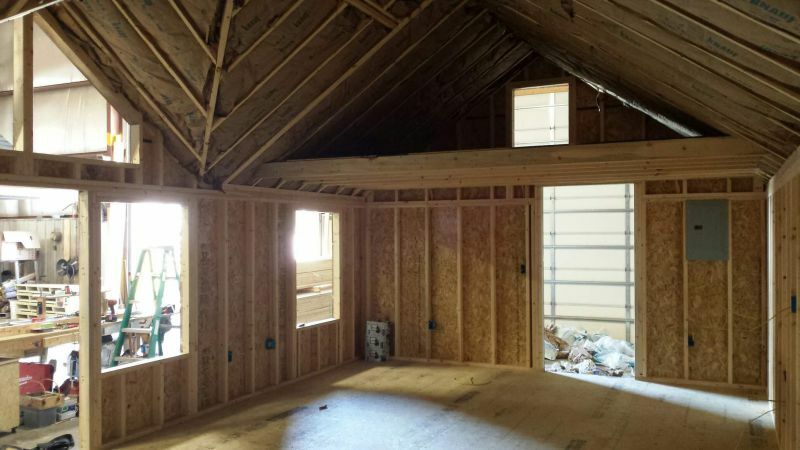 Almost completely finished with the upper floor (bedroom). 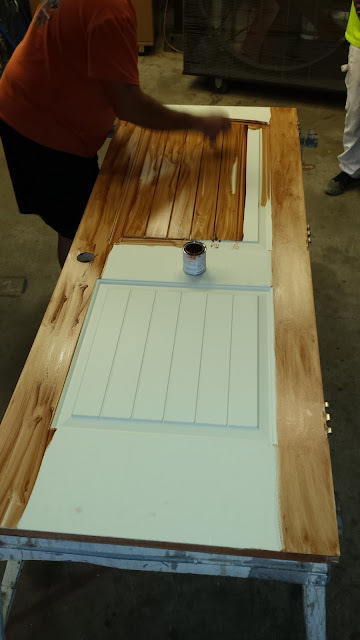 I ran a few boards short on the trim, and I still need to buy/install a door on the bathroom. 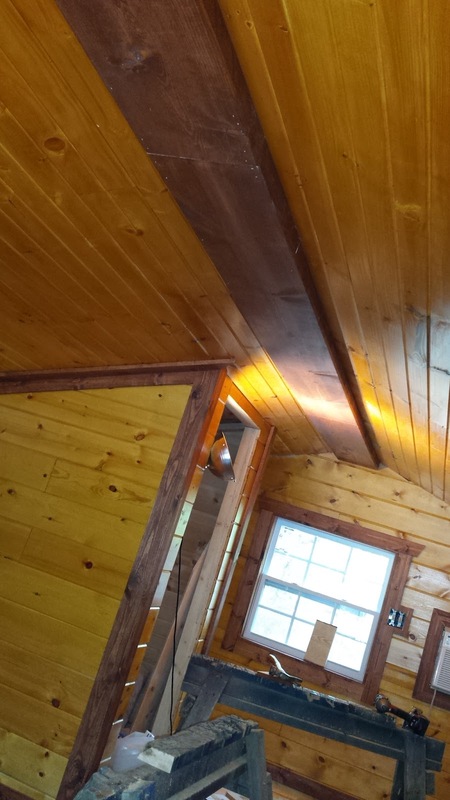 But I got the faux center beam in, most of the trim, and mounted a ceiling fan light fixture. 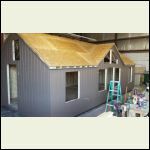 I should get the last pieces of trim up this weekend, and I am hoping to find a door I like at the resale yard tonight. I might have to buy a new one if they don't have any viable candidates. Labor day will be the 2nd year anniversary since we started framing it up. We aren't setting any construction records, but we are paying for it as we go. I think after this weekend, I can move the furniture in upstairs and shift operations to finishing up the downstairs. A little more work done this last weekend. We crossed a significant milestone. 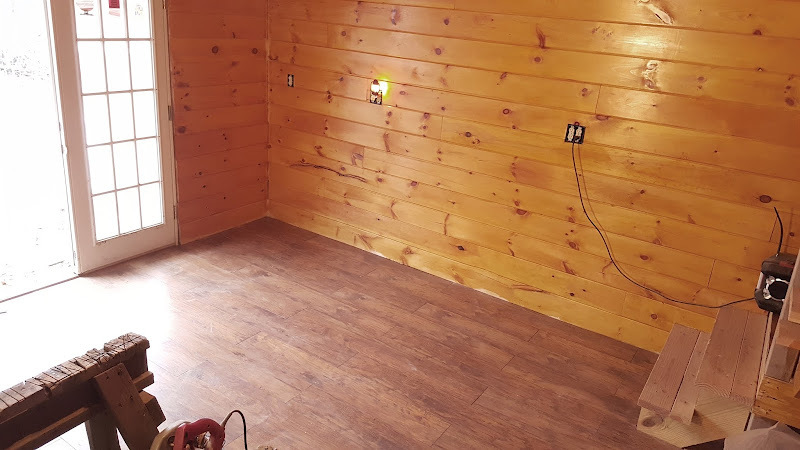 With the exception of installing the bathroom door, and the wall plates for the electrical outlets, we are done with the upstairs of our cabin. 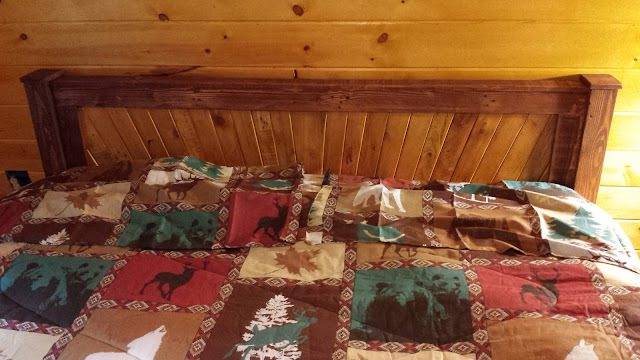 Our plan was to buy a new bed for our house and taking our existing bed down to the cabin, so we did that this weekend. Just an FYI... if you are very good, and very careful, you can get an entire king-size bed into the inside of a Ford Excursion. Mattress, box springs, headboard, frame, the whole schlemiel. The head-board was custom made for us by my buddies dad out of discarded pallets. 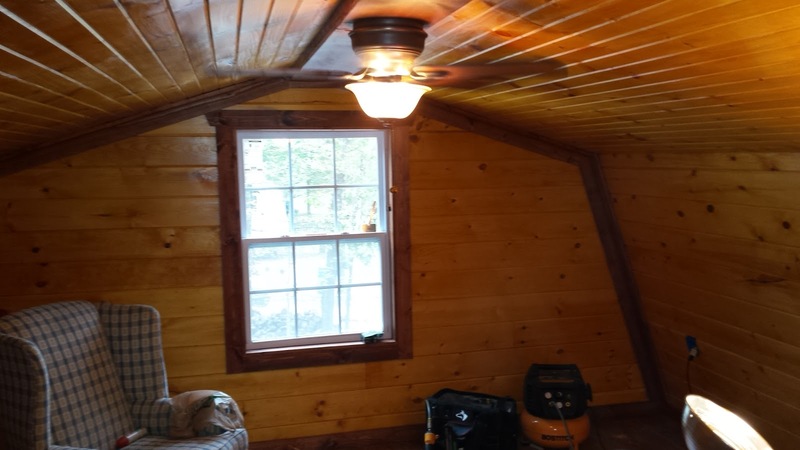 I shellacked and stained it to match the walls and trim in the cabin. Of course, the wife bought some suitable bedding that we had to bring down too. We had also picked out some curtains and valances, and I figured I would put them up too. Now the wife will start the decoration in earnest. About the aforementioned bathroom door... 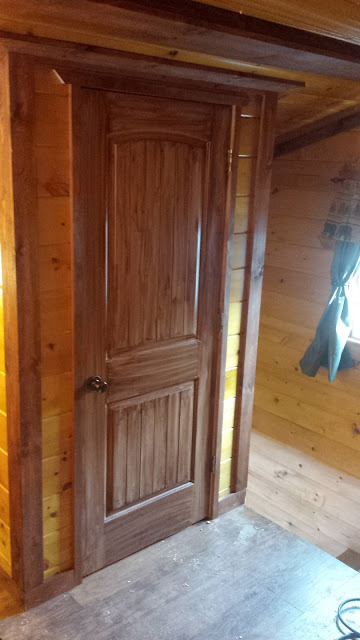 I wanted a solid pine door, but at over $200 for a pre-hung it was pretty much out of budget. I searched Craigslist for a used one, but the only one that was the right size was hinged the wrong way. using nothing but some stain. I know, I know... 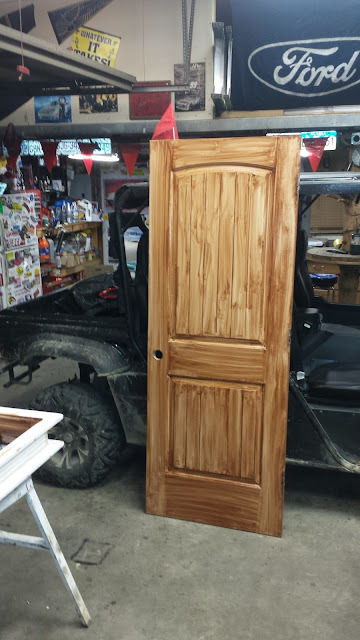 It will never fool anyone into thinking its a real solid wood door, but I think it looks cool. I have it down at the cabin, propped up in the opening and it looks great. I'll share pictures of it once I get it installed and trimmed out. I enjoyed reading through your blog. It reminded me of ours back when we started and watched it come "out of the ground" one step at a time. 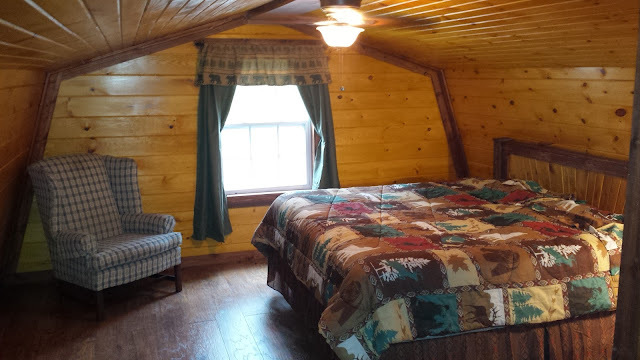 Your cabin turned out beautifully! As I have said before on here...I cannot put a lot of money into it because I can't insure it and it's sitting in the middle of no where. Police/Fire can't get to it with a locked gate and hills that require an ATV to ascend...so...it will just have to be a nice retreat for hunting and the grand kids. But I loved every minute of building it and sitting in it on a cold winter day with a nice warm fire and cup of coffee! I finally got some time to work on the cabin. I put the 'DONE' stamp on everything on my list upstairs. Got the bathroom cleaned out (it turned into a storage locker during construction). The wife really liked the exposed stud look. I think it looks unfinished, but I'll let her win for now. 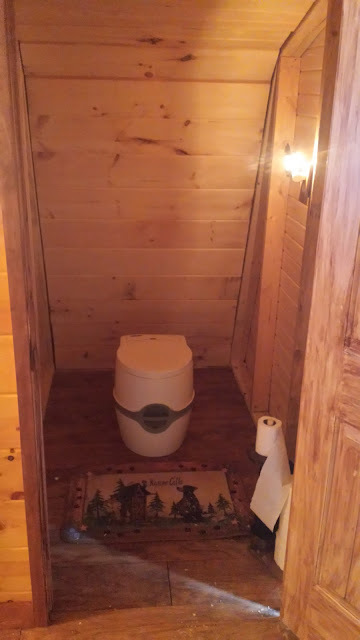 For a toilet I am using a Thetford Curve portable toilet. It works very well, and is totally odor free. It's not terribly nasty to empty. 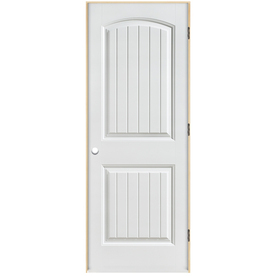 As you can see, I also got my fake wooden door installed as well. The great thing is we actually got to stay in it. We have spent two weekends in it. Its so nice to getting to use the fruits of our labors. 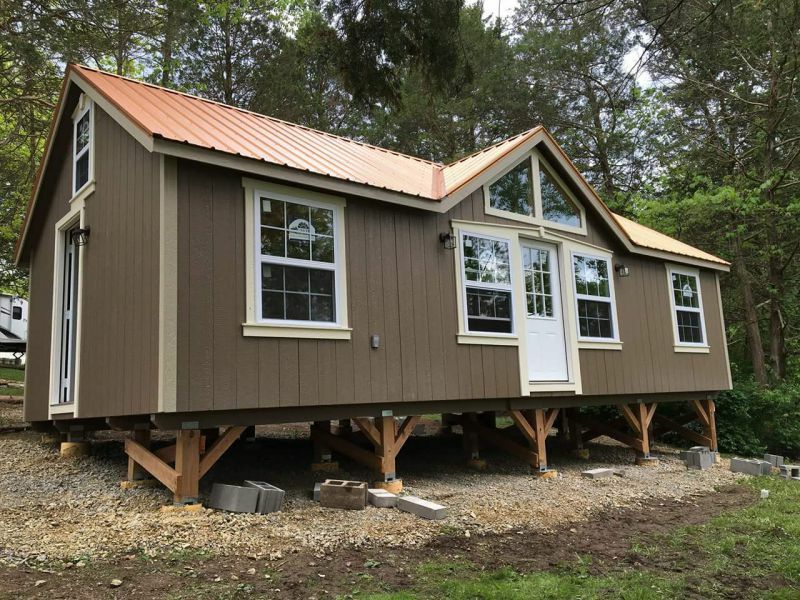 Of course, it seems that nothing is ever truly "done" on a cabin build. 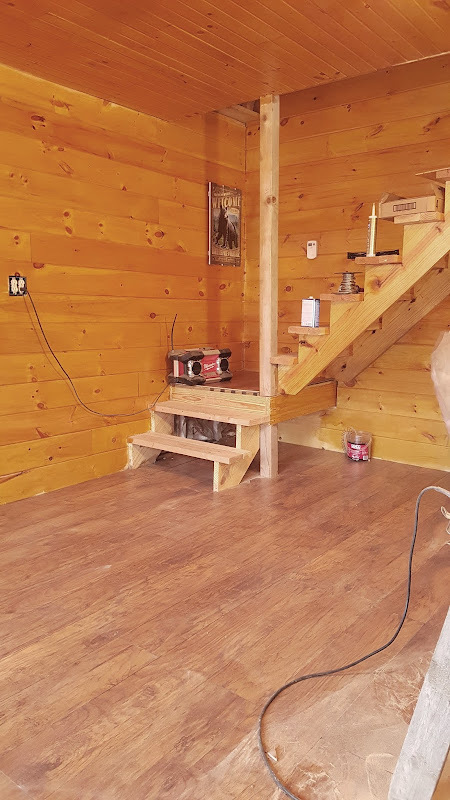 The big news is that the shellac, fireplace and flooring downstairs are done. We have also ordered the cabinets for our "kitchen" area, and we hope to have them first part of April. I'm starting to put up the trim downstairs while we wait for them. We are closing in on being able to put the done stamp on the whole thing. I have scheduled the grand-opening party for he 4th of July weekend, so I have that hard and fast deadline to meet. But it shouldn't be a problem. 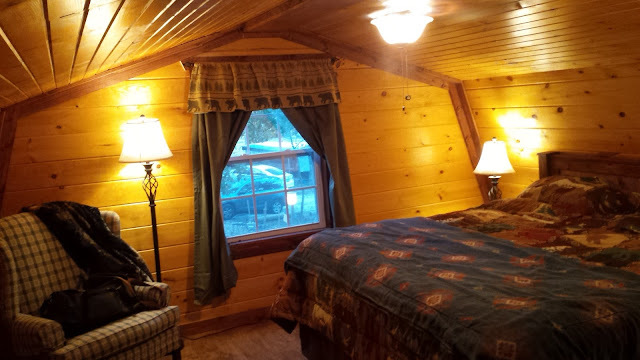 Oh, I love your cabin! ESPECIALLY your loft bedroom -- it's beautiful and so cozy! The stairs are neat. They don't look like they take up much room. 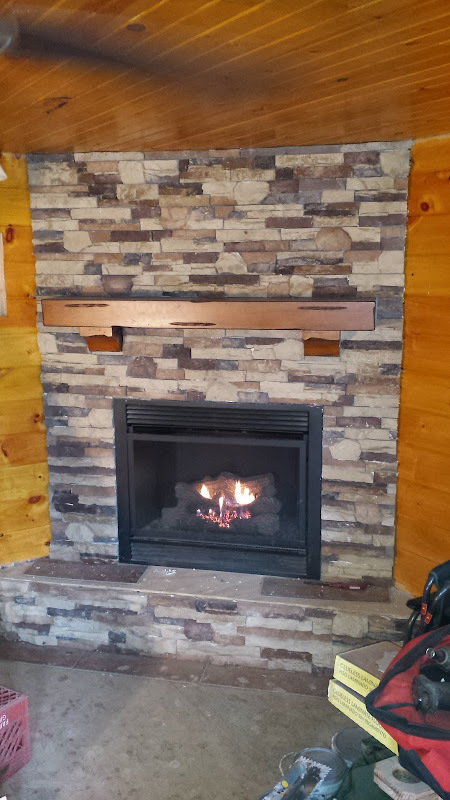 Great job on the fireplace and stonework! Tim - hate to be a killjoy, but you are never "done". Always some tweaking to do. Looks great! Let's just call it "done enough to go work on other projects"
I love it!!! every single thing about it.......love! Look great!! Job well done! Wow. You and your family/friends did an awesome job. Fellow Goose Creek weekender here. We bought a lot on the lake this past year and are in the process of getting our cabin foundation built. Hope we can pull off a build half as nice as yours. Thanks for the ideas on you blog. Wow. You and your family/friends did an awesome job. Fellow Goose Creek weekender here. We bought a lot on the lake this past year and are in the process of getting our cabin foundation built. Hope we can pull off a build half as nice as yours. Thanks for the ideas on you blog. JamesBlue Bird Dr.
Hell, stop on by sometimes. We are over on Possum Hollow, 4 or so lots up from Pawnee on the right, just past the brown house. If you see a big, jacked up white Excursion, I am there. 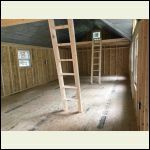 I'd love to see what you are doing for a cabin. The kitchen cabinets I ordered from Menard's came in. Well, most of them. I should get the rest this week. 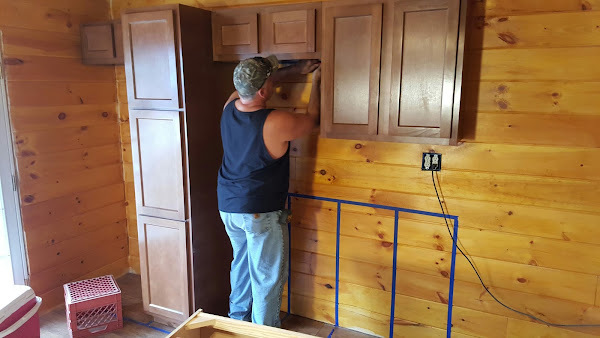 I always thought that installing cabinets would be a complicated operation, but it turns out that its not that bad of a job. It took my carpenter buddy and me about 25 minutes to hang the wall-mounted cabinets. The fridge goes in the nook to the left of the pantry, and a microwave shelf goes under the 12" cabinet on the right of the pantry. Getting down to the nitty-gritty. 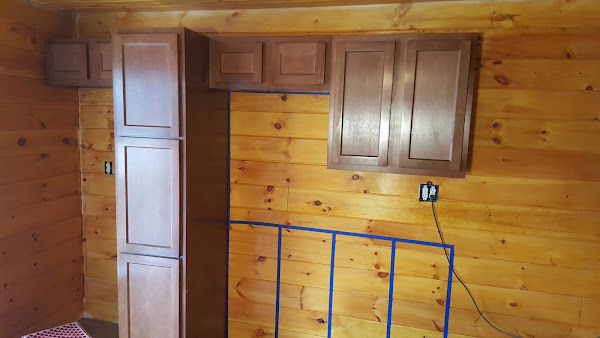 Just the cabinets and the downstairs trim, and the interior will be done! We will plan on running up to see ya sometime soon. We need all of the ideas we can get. 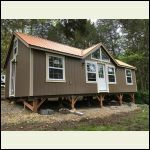 We had plans to build from the ground up but we found a cabin/shed for about the same price as we were going to build. Plus I thought building from scratch was going to test my skills a little too much. It will be delivered at the beginning of May. 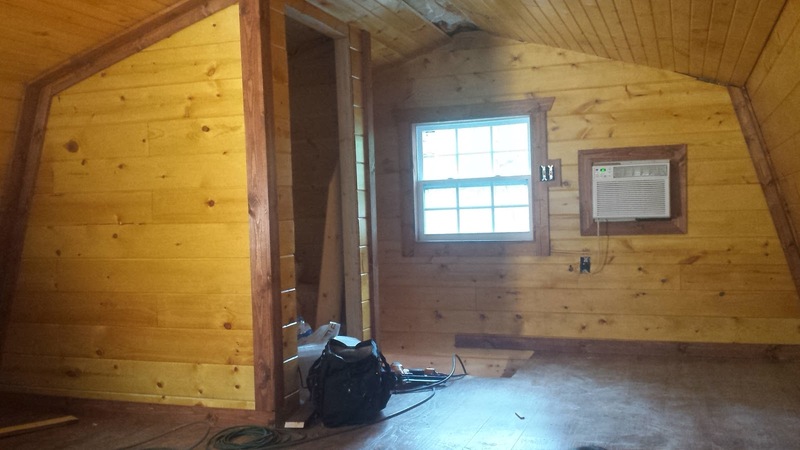 Here are a few pics of the cabin so far. WOW that thing looks awesome. I can see some real potential there. Finally got it on our lot. Here it is!!! 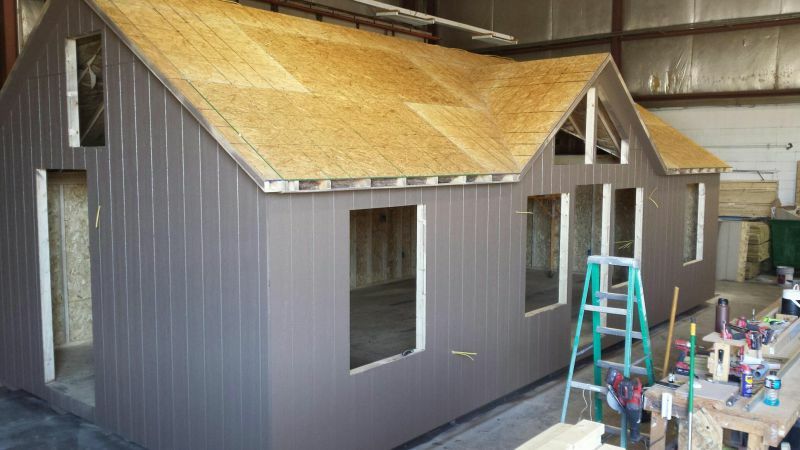 Ready for all of the finishing touches. We will definitely be stealing a lot of your ideas. Awesome. I gotta come see it. You gonna be down this weekend? We should be there Friday evening and Saturday Evening. Stop on by if you have time. I like the ceiling finish, was that assembled on site or shipped in as 1 piece? Who was the builder? What are the dimensions? I don't want to hijack Tim's thread so I was trying to start my own. I am having some difficulty with my thread so to make a long story short, It was brought in one piece. 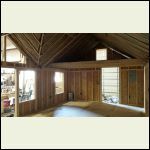 I had all of the framing to level it pre-built and we placed and secured all of it once they had it in the correct spot. The builders were 5 Star Buildings out of Cuba, MO.